Get a BC spoon. Use the form on this page and let me know if you'd like to place an order or would like additional information. Since I make these in small batches I often have a limited inventory. Once you contact me and I reply it may take some days for me to carve your spoon from log - finish + shipping. If you need something faster include a note in your message. The Spoons cost $45. Free USA shipping. The Backcounty Wooden Spoon. These are designed to be burly (like you), perform in the backcountry (like you), and look really good doing it (like you). The spoons we're talking about are long enough to reach into the various freeze dried meal pouches as well as a 'fair share' or other standard containers one may use on trips. These spoons are my way of introducing two of my passions to one another. Backcountry travel meets traditional carving. The first version of these were given to a team of 6 folks biking 350 miles from the remote village of McGrath, Alaska to Anchorage, Alaska along the Historic Iditarod Route in February. They withstood much abuse, shed the sticky parts of those meals better than plastic spoons & felt better than titanium ones. They are also another way to include more natural items in your trip while leaving some plastic behind. This design also works really well as a general kitchen cooking spoon at home or in a cabin. 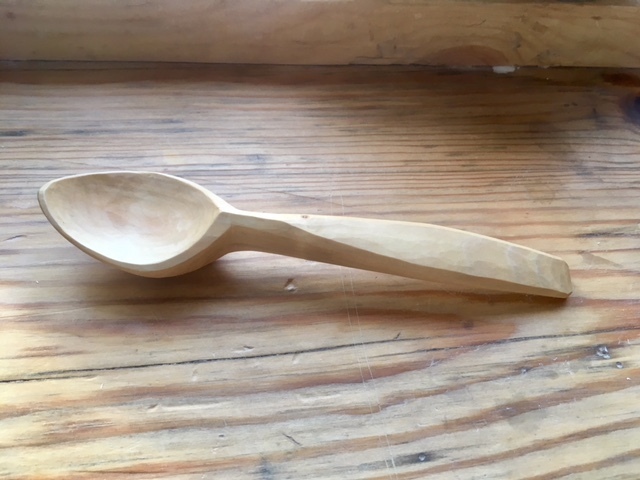 Knowing that these spoons add some value to people's lives and trips is important to me, just as people recognizing the value of nature, wilderness, craftsmanship and care is important to me. Tell me about how you use your wooden spoon. These are all made from Birch trees harvested in Alaska. Most of the trees I've been using have been cleared for trail projects. I carve them with an Axe and a variety of traditional straight and crooked knives. They are treated with a food safe oil. Learn more about this on my Wood Care page.